Staying on top of household cleaning can feel like climbing a never ending mountain. When picking up my house, I often feel like Bill Murray in Groundhog's Day: Didn't I just pick up this toy yesterday… and the day before? After years of attempts to streamline my cleaning routine, I finally discovered two game changers. The first is timing chores. Yep, that's right. It's time to set the timer on your phone and see how long chores actually take. Before I timed myself, I was overestimating how much time cleaning and straightening would take. This would cause me to push them back to a day when I thought I would have more time to get things done. What I learned was many tasks did not take as long as I thought and I could actually save time by doing a few things every day to keep the house up. For instance, I learned that I could make three beds and wipe down two bathroom counters in 10 minutes or less. Once I had a time frame for each chore, I could work tasks in according to how much time I had that day. The second change I made was creating a weekly cleaning schedule. Spreading the chores out over the span of a week makes cleaning the whole house feel less labor intensive. It may take a few weeks to get into a groove, but once you find what works you will fall into your schedule with ease. I break my schedule into a few small daily tasks along with one bigger task each day. I created my schedule after timing my chores for a week, then figuring out how to spend only about one hour (or less) a day on cleaning. For a jumping off point, view my schedule below but customize according to your household needs. 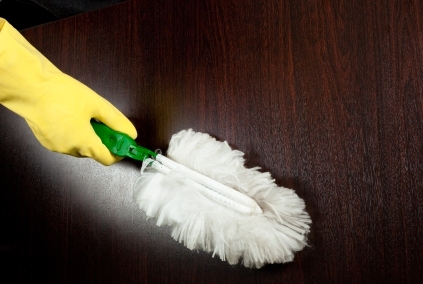 Using a schedule for cleaning may look like a lot of work on paper but sticking to the schedule will actually save you time. Overall, your house will stay neat and tidy and you will have more free time to spend as you wish.